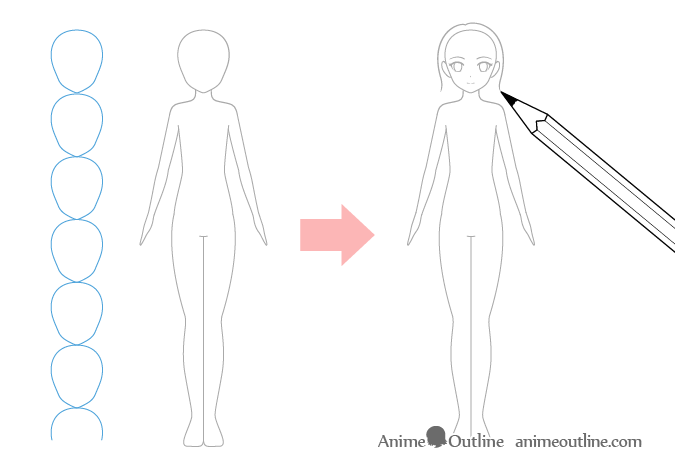 This guide is an introduction to the basics of drawing with a focus on the anime and manga style. It provides tips on approaching the drawing process in the right way and suggests some beginner friendly exercises to help you get started. This guide covers the first part of that list. Draw using light lines first and then trace over them with darker lines once you are sure that everything is in the right place. This be especially helpful for large or more complex drawings. Light lines are easier to erase if you make a mistake and easier to make (you don’t have to press as hard on the pencil so your hand will be less tired). 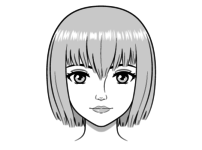 Even if drawing digitally it’s still a good idea to first make a sketch and go over it with cleaner lines afterwards. Tracing your own lines will also work as another exercise to help steady your hand. Try and draw with as few lines as possible. If you make a mistake with your first line it’s fine to add more lines until you land the correct one but don’t scribble or draw extra lines just for the sake of it. If you make too many mistakes erase that part of your drawing start over. 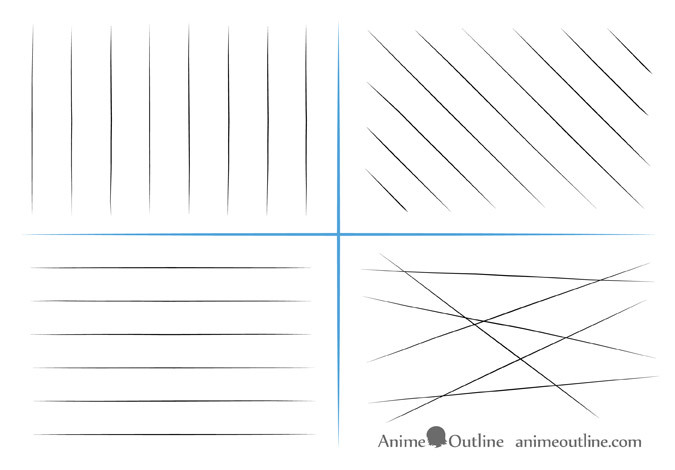 Use guide lines to help yourself draw. 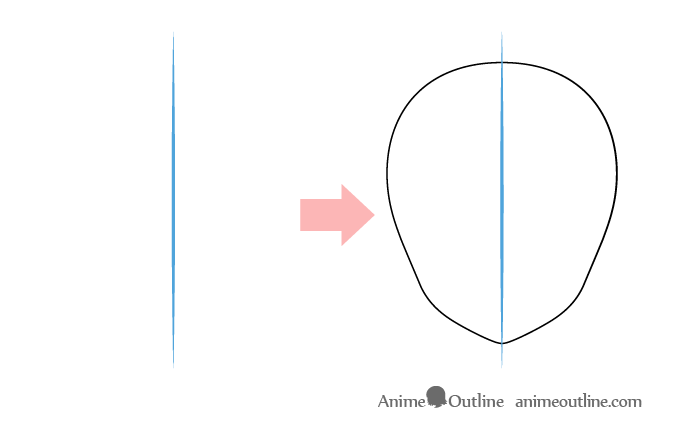 For example if you want to draw a symmetrical head/face from the front view you can first draw a horizontal line though the middle of where you want to draw the face. This line will help you make sure that both halves of the face are even in width. You can then draw a horizontal line (or several lines) to help you make sure that both eyes and both ears are on the same level. Estimate your proportions before you start drawing. 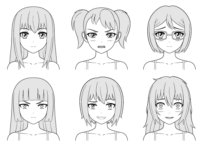 You can see that in the above example the girl is 6 1/2 heads tall (as anime characters tend to have larger heads in relations to their bodies then real people). By comparing the size of different parts or objects in your drawing to one another you will be less likely to make a mistake. Regardless of what you are drawing start with the larger shapes first. You don’t need to always start with the absolute largest shape but definitely don’t start with the smaller details. 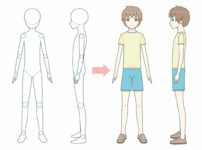 If you area drawing a person start with the head and work your way down through the rest of the body. 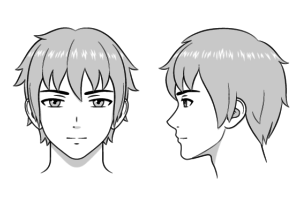 Don’t draw the smaller details like the facial features until you have the shape of the entire body. Drawing this way will make it a lot easier to fix mistakes. 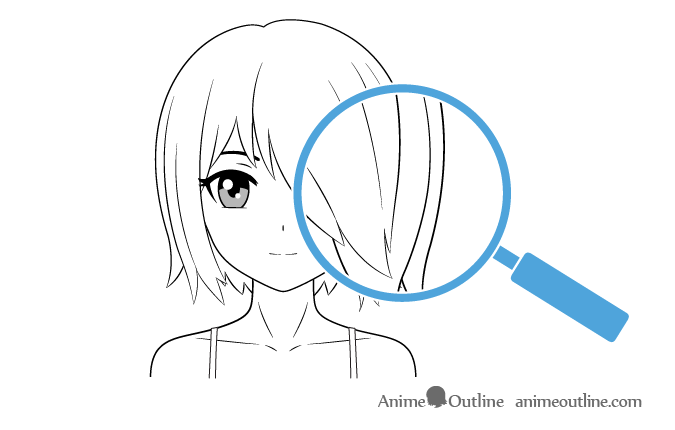 For example if you fully draw out the head with all of the details of the facial features you may then find that the body doesn’t actually fit on your drawing area. 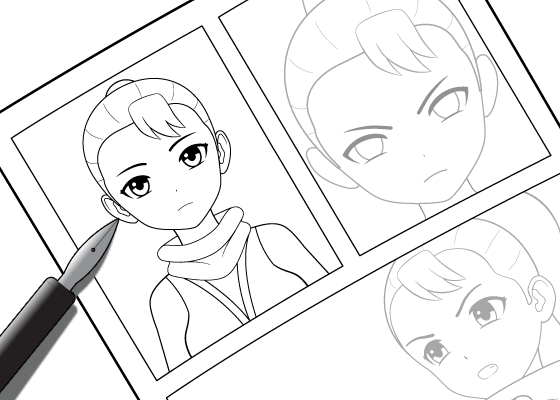 You will then have to start over and redraw the entire face again. Some of these mistakes can be easier to fix if drawing digitally but that doesn’t mean that you should not learn to draw in the correct order. Try and keep the various objects in your drawing in roughly the same state of completion. 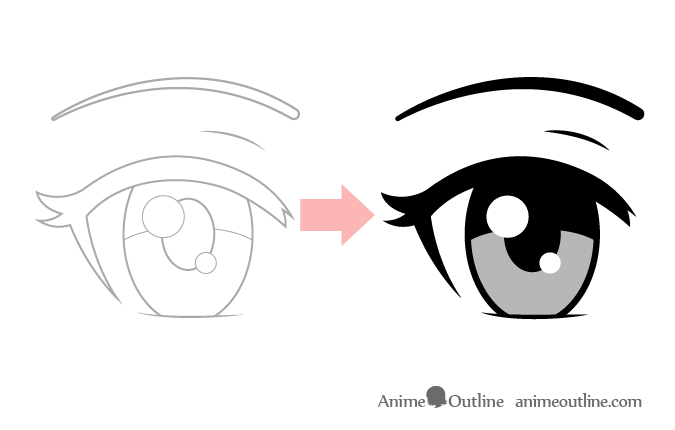 If for example you are drawing eyes than draw the outer shape of each eye and then draw the shape of each iris. By doing so you will be more likely to notice if the first one is out of place and you will only need to do a little back tracking if you make a mistake (similar to the previous example). It’s sometimes a good idea to draw things that are hidden by something else. 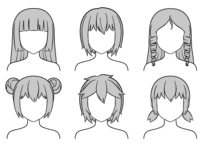 In the above example some parts of the head and face will be hidden by the hair in the final drawing but you may still want to draw their basic shapes and erase them later. The reason for this is to insure the correct placement of the parts that are visible. For example by doing a light drawing of the second eye you will be able to check the spacing between the eyes which will help you insure that the visible eye is correctly placed. 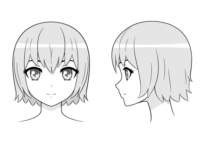 You can also draw the outer shape of the ears to estimate the volume the hair needs in order cover them. As a beginner artist you can really benefit from some fairly simple exercises of drawing lines and basic geometric shapes. These exercises will help steady your hand and train you to see (and avoid) common mistakes. You can do these for about 10-15 minutes at a time. 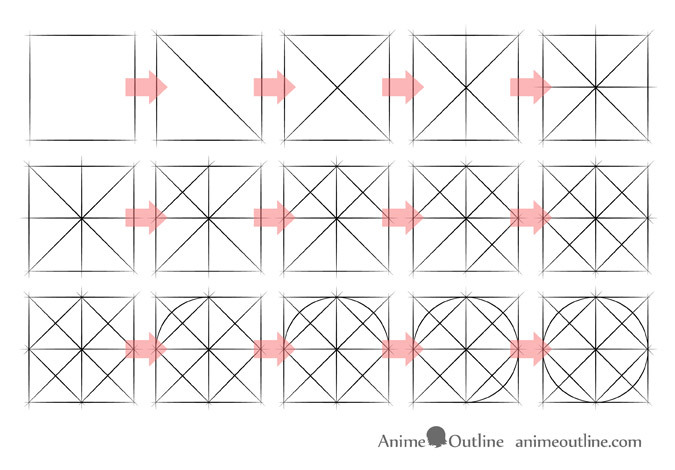 The most basic exercises is drawing straight lines in different directions. Draw horizontal, vertical and diagonal lines without rotating your drawing area (paper, tablet, etc…). 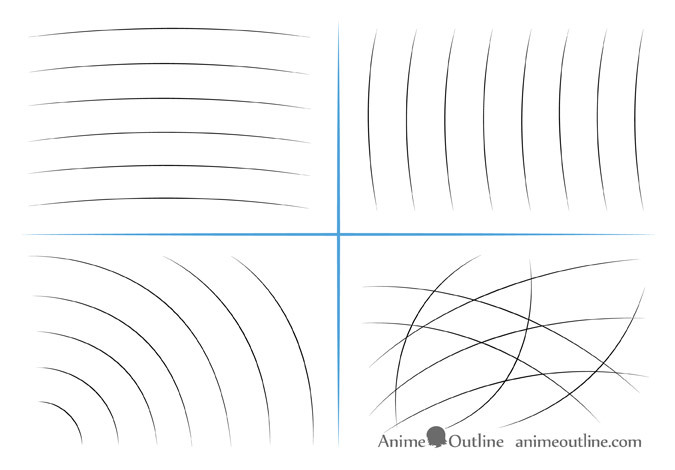 In addition to straight lines practice drawing curved lines in different directions and try to have nice and smooth curve without jitters or sharp turns. Just like for the straight lines exercise don’t rotate your drawing area. Try and draw each shape with only one stroke per side. Draw the circle and ovals with one solid line from start to finish. Don’t worry if your shapes don’t come out right, simply try and improve on the next shape. You can also combine the drawing exercises. For example you can draw a square than inside it draw lines going from one corner to another followed by two more lines going through the intersection point of those lines followed by drawing a circle inside the initial square. But unlike the previous exercise draw this circle a quarter at a time. In addition to all of the previous benefits this exercise is also really good for learning to draw symmetrical shapes. 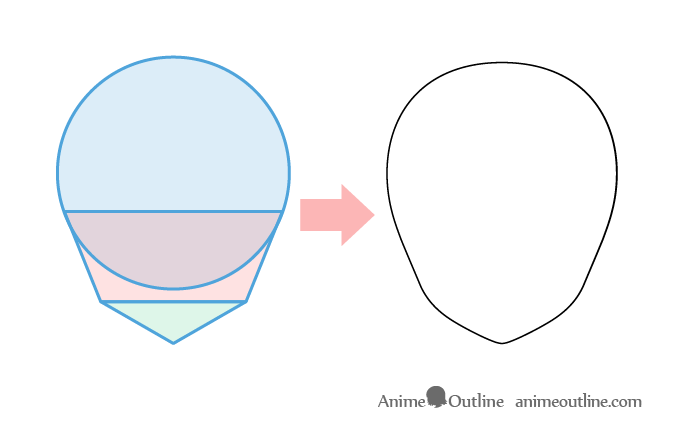 In the above example you can see how an anime style head can be broken down into three simple shapes. The same can often be done with other parts of the body and various other objects. 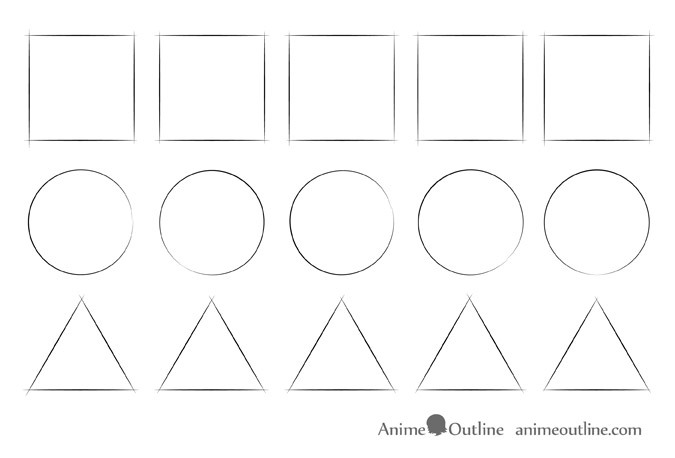 You don’t need to actually draw all of these out every time you want to draw something but its a good example for why learning to draw basic shapes can be so useful. To make art that looks like anime and manga you have to understand their defining characteristics. 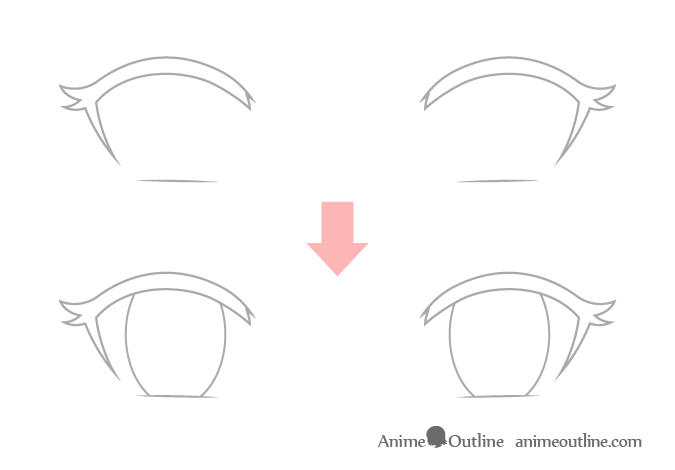 Fortunately there are plenty of tutorials here on AnimeOutline to help you study these styles. 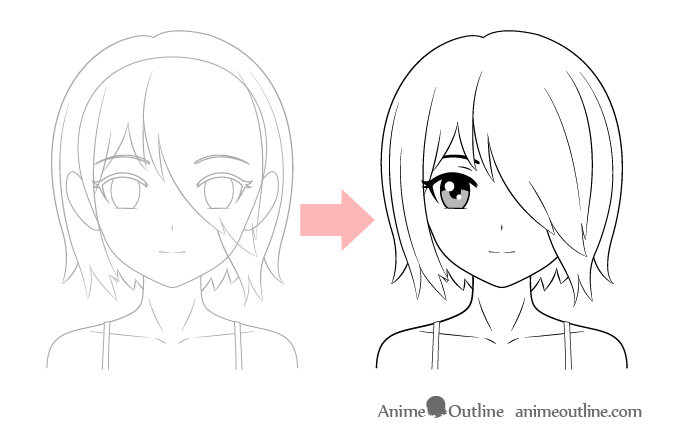 Simply see the Anime & Manga Drawing Tutorials section and pick whatever it is you are interested in drawing. If you are having trouble spotting your mistakes turn your drawing upside down or hold it up to a mirror. This will give you a fresh “perspective” making it easier to see them. 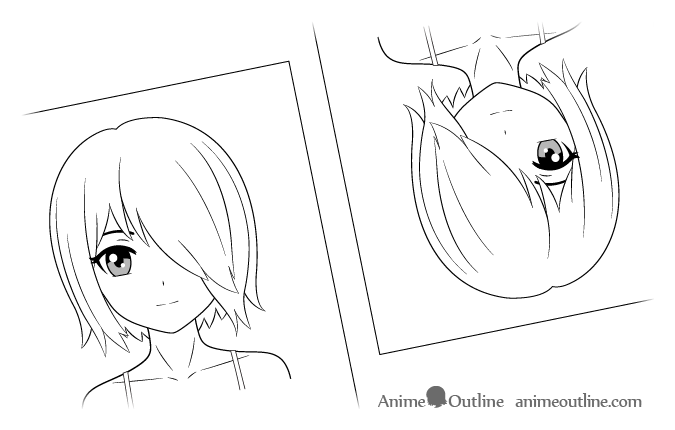 Doing the exercises and applying the drawing tips suggested above will help you with the basics of drawing anime. Once you you have a fairly steady hand with good control of your pen or pencil and feel that you have a good grip on drawing basic lines and shapes you can move on to more advanced aspects of drawing such as perspective, color and shading.